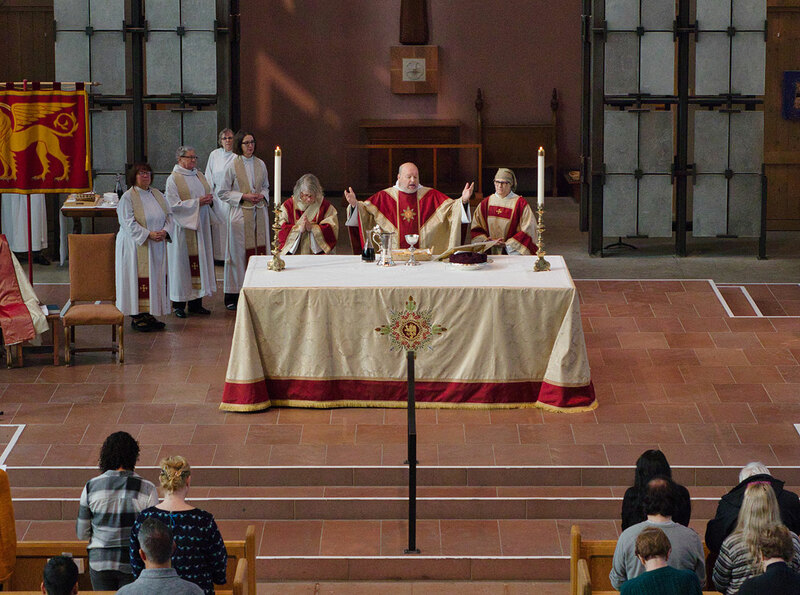 As the cathedral church for the Episcopal Diocese of Olympia, Saint Mark’s seeks to be a place where all people encounter the living God and the reconciling Gospel of Jesus Christ. Wherever you are on your journey of faith, you are welcome at Saint Mark’s. The 9 a.m. and 11 a.m. services at Saint Mark’s last a little more than 1 hour. Other services may run shorter. Just bring yourself. Everything you need, including Scripture readings, is in the service leaflet, which the ushers will give you. View a sample service leaflet. You will find people dressed very casually (jeans, shorts, t-shirts, etc. ), more formally and a great variety in between. Just be yourself. You will fit in. Saint Mark’s has four pew sections and bench seating along the side walls. Sit wherever you are comfortable. Make yourself at home. By the north wall (to the right) there is a rug where small children are welcome to sprawl out and explore the “children’s bag” available from the ushers. Parents can sit on the benches nearby. We have a large parking lot next to the church. Parking is also available in the neighborhood. Can I bring my children to church services? Children are welcome and active participants in all Saint Mark’s liturgies. Activity bags for younger children are available at the back of the church and there is an area for quiet play on the colorful carpets along the north walls of the Cathedral. We offer a wide variety of programs for children and youth on Sunday mornings. Our Child Care Center also welcomes children ages 3 months through 5 years between 8:30 a.m. and 12:30 p.m. on Sunday mornings while their parents are participating in Cathedral activites on campus. Our nursery is equipped and staffed for the safety and care of younger children. Please ask an usher for directions to the Center. Nursing mothers who would like some privacy are welcome to use Thomsen Chapel during the services. Audio from the services may be heard. Please check with an usher for access. Can my children receive communion? Children are welcome to receive communion at their parents’ discretion. If you would like for your child to learn more about the sacrament before receiving, please contact Kelly Moody.